Steel beams, from H sections to UNP sections in standard dimensions or customized. Steel beams in countless shapes and forms, each with specific applications and advantages. Swanenberg IJzer Groep has a large stock of all versions of wide flange H beams, IPE steel beams, hollow sections, and solid shafts for the most diverse construction purposes. Whether for temporary bridge or viaduct support constructions, purlins, sheet piling, or hall construction, our steel beams, steel sheets and plates, manufacturer’s plates, hollow sections, and rounds form the basis for any successful project. They can always be provided in standard dimensions or bespoke and ready for use. The light variant of H beam steel, which can be recognized by a somewhat thinner flange and an H-shaped cross-section. The last letter represents the thickness of the flange, wherein A represents the thinnest version of H sections. The height of the beam is lower than the flange width in HEA beams. This applies up to the maximum flange width of 300 mm. After that, the height of the steel beam increases and the flange width remains 300 mm. The intermediate variant of H beam steel. Compared to the HEA beam, the HEB beam has a greater load capacity and the flange is somewhat heavier and wider than in the HEA beam. The flange width is equal to the height up to 300 mm. Above that, the flange width is fixed at 300 mm. The strongest and heaviest variant of H beam steel. The HEM beam is bigger and heavier than HEA and its flange is thicker, for a heavier load. The lightest variant of steel beam manufactured to European dimensions. IPE beams are often employed for construction purposes. The flange width is approximately half the beam height in IPE steel beams. Hot rolled steel channels, available up to a height of 400 mm. 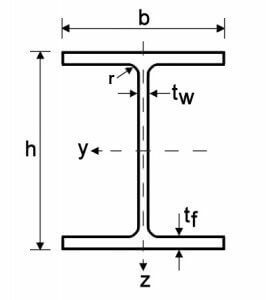 Steel beams with a UNP section can be recognized by the tapered flanges. From square to asymmetrical tubes, both welded and seamless, cold and hot rolled, we provide hollow sections for various construction purposes. Solid shafts in various grades and dimensions, both round and rectangular, available immediately from stock. These solid shafts are often employed for construction purposes in machine construction and turning shops. Swanenberg IJzer Groep processes steel sheets and plates of various grades into partitions, head plates, and all types of bespoke sheet and plate metal work. These can then be welded to our beams and sections. For this we have in-house flame and plasma cutting tables, enabling us to fulfil all the market needs. If you have questions or would like to receive more information about our working method or the steel beams, you can reach us on telephone number: +31 486 46 9120.